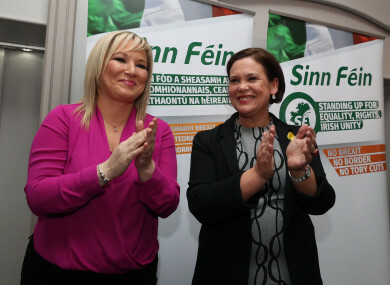 Michelle O'Neill alongside Mary Lou McDonald. MICHELLE O’NEILL HAS become the first Sinn Féin politician to throw her hat in the ring for the deputy leadership of the party. Mary Lou McDonald will vacate the number two position next month when she takes over from Gerry Adams as leader. Nominations for the deputy role open this morning and so far O’Neill, who took over from Martin McGuinness as the party’s leader in the North, is the only candidate to declare her interest publicly. Asked on RTÉ’s Morning Ireland whether he would also be interested in going for the job, Sinn Féin Dublin Mid-West TD Eoin Ó Broin said he would not. There should be a contest if there are two people or more who want the position. Manufactured contests to keep the media happy is not what Sinn Féin is interested in. Ó Broin endorsed O’Neill as an “incredibly competent politician who would do the job very well”. McDonald was the only person nominated for the leadership of the party, and the Dublin woman will be formally ratified in her new role at a special Ard Fhéis next month. Sinn Féin National Chairperson Declan Kearney said in a statement that the partly looked forward to “another truly historic Ard Fheis and a healthy and democratic campaign to elect the next Leas Uachtarán Shinn Féin”. Nominations officially open at 9am and remain open until next Monday. I won’t fill Gerry Adam’s shoes but I’ve brought my own and together we will walk a journey that is full of opportunities, full of challenges, but I believe which marks a defining chapter in our achievement in a United Ireland and the ending of partition. That’s not a pipe dream, that’s not empty rhetoric, that is the road we are on. This isn’t uniquely a project for republicans or nationalists, I believe that Irish unity is the best solution, the best collection arrangement for all our people, including our unionist brothers and sisters. Fresh talks aimed at breaking the impasse at Stormont are due to begin on Wednesday of this week. Email “Nominations for the deputy leadership of SF open today - so far there's just one candidate ”. Feedback on “Nominations for the deputy leadership of SF open today - so far there's just one candidate ”.